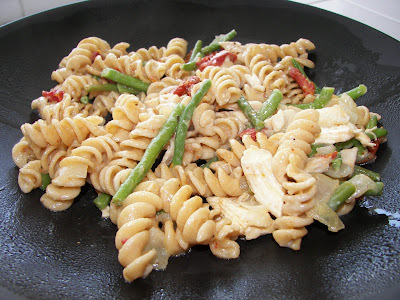 I cannot remember who's blog I found this recipe on, but it's a delicious and creamy pasta. She said that she had copied it from a dish at Macaroni Grill. In her recipe (listed below) she used broccoli, but that's not a favorite in our house so I substituted green beans. They were fresh and frozen ones, but the taste was a little strong. I think next time I might try frozen peas or corn...or both. The only tip I would give is that when you're making the sauce it's going to feel like you're adding a LOT of milk and that it's going to be too thin. But, don't worry. If you keep stirring and keep it over heat like she says, it turns out creamy and wonderful. We loved it! Cook pasta according to package directions. Add frozen broccoli for the last 3 minutes of cook time. For the sauce, melt the butter in a skillet then add flour and stir until well combined. Pour in milk and stir. Add chicken and sundried tomatoes and cook until heated through. Combine once both are finished and stir.